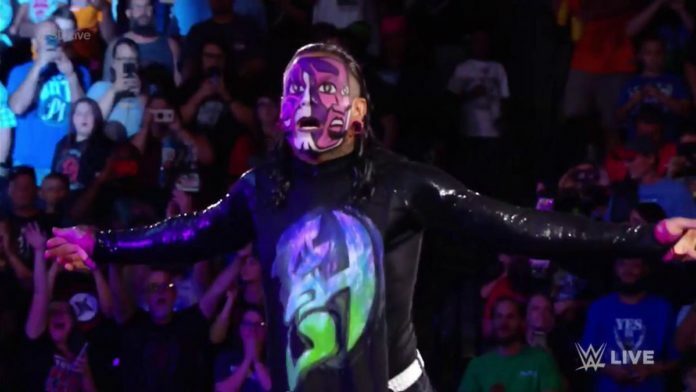 Jeff Hardy battled Samoa Joe tonight on WWE SmackDown. The winner of the match would qualify for the WWE World Cup at Crowd Jewel. Samoa Joe controlled the match early before SmackDown went to a commercial break. When SmackDown returned, Joe was still in control and Jeff in a Headlock in the middle of the ring. Jeff broke free but Joe slammed him back to the mat and followed it up with a Senton for a near fall. Jeff booted Joe in the knee and Joe collapsed to the canvas. Joe threw Jeff out of the ring and set him up against the steel steps. Joe went for a kick but Jeff got out of the way and Joe’s knee struck the steps. Back in the ring, Jeff continued to target Joe’s injured knee and hit him with a Leg Drop. Joe knocked Hardy down with a right hand and then tried to get up but Joe’s knee gave out. Joe tried to get up once again but fell down again and the referee called for the bell.